As of 2003, Spam is sold in 41 countries worldwide, sold on six continents and trademarked in over 100 different countries. In the United States in the aftermath of World War II, a troupe of ex-G.I. women was created by Hormel Foods to promote Spam from coast to coast. The group was known as the Hormel Girls and associated the food with being patriotic. In 1948, two years after the group's conception, the troupe had grown to 60 women with 16 forming an orchestra. The show went on to become a radio program where the main selling point was Spam. The Hormel Girls were disbanded in 1953. Spam is still quite popular in the United States, but is sometimes associated with economic hardship because of its relatively low cost. The residents of the state of Hawaii and the territories of Guam and the Commonwealth of the Northern Mariana Islands (CNMI) consume the most Spam per capita in the United States. On average, each person on Guam consumes 16 tins of Spam each year and the numbers at least equal this in the CNMI. Guam, Hawaii, and Saipan, the CNMI's principal island, have the only McDonald's restaurants that feature Spam on the menu. In Hawaii, Burger King began serving Spam in 2007 on its menu to compete with the local McDonald's chains. In Hawaii, Spam is so popular it is sometimes referred to as "The Hawaiian Steak". One popular Spam dish in Hawaii is Spam musubi, where cooked Spam is combined with rice and nori seaweed and classified as onigiri. Spam was introduced into the aforementioned areas, in addition to other islands in the Pacific such as Okinawa and the Philippine Islands, during the U.S. military occupation in World War II. Since fresh meat was difficult to get to the soldiers on the front, World War II saw the largest use of Spam. GIs started eating Spam for breakfast, lunch, and dinner. (Some soldiers referred to Spam as "ham that didn't pass its physical" and "meatloaf without basic training".) Army soldiers commonly refer to SPAM as Special Army Meat due to its introduction during the war. Surpluses of Spam from the soldiers' supplies made their way into native diets. Consequently, Spam is a unique part of the history and effects of U.S. influence in the Pacific. The perception of Spam in Hawaii is very different from that on the mainland. Despite the large number of mainlanders who consume Spam, and the various recipes that have been made from it, Spam, along with most canned food, is often stigmatized on the mainland as "poor people food". In Hawaii, similar canned meat products such as Treet are considered cheaper versions of canned meat than Spam. This is a result of Spam having the initial market share and its name sounding more convincing to consumers. Using a fork prick each potato, cook 8 minutes on high in the microwave. In skillet, heat oil over medium heat. Add spam and sprinkle with pepper, saute spam until lightly brown. Season potatoes with salt and pepper. Add chopped potatoes, green onions and cheese. Toss. Enjoy! Going to have to try this potato salad! Thank you Janet! I hope you enjoy! Although I don't eat spam, I do appreciate good food photos! Nice job Christine. I like spam. Interesting info and dish! Great combo and thanks for this useful post! Thank you Inessa! I hope you enjoy! this salad is new to me, but it look really great! I love Spam, and I know I'll love it even more with your potato salad! Also enjoyed reading the interesting history of Spam. 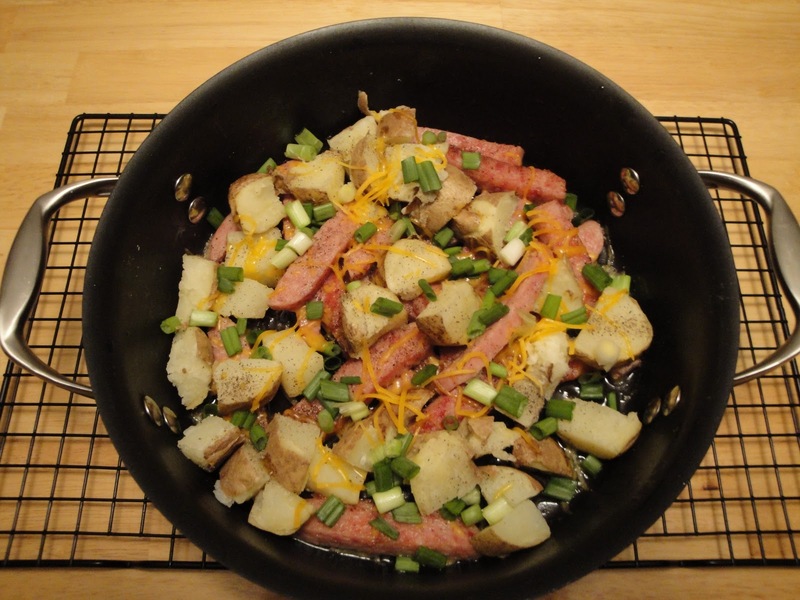 I like this recipe, Spam is like the flavoring piece to all the other ingredients. Interesting information here on that product also. Thanks for the great recipe, glad to stop in and learn more about food also. Have a Merry Christmas! Spam was pretty much a staple when I was growing up because it helped stretched Dad's paycheck that had to feed 7 mouths. I like it but I haven't had it in ages. This recipes look like a great way to jump back on the Spam wagon. Thanks! I"m always amazed at the amount of Spam that is in Hawaii - and they make the most amazing things with it! Thanks for sharing! Spam is not bad one you get past the thought that you are eating spam. So interesting Christine! It has been a long time since I have had Spam! Koreans have a similar relationship with Spam going back to the post war period when GI's would give away their excess Spam to the war-impoverished Koreans. It's still common for Koreans to give away large gift baskets of spam during major holidays and is considered a comfort food and does not carry the stigma it carries in the US mainland. I usually eat Spam with rice, this looks like a great recipe! what a great way to enjoy spam! Delicious! Spam has a huge following in Alaska--this would be very popular up here!